We`re proud to offer our TO&A Rancho Mirage Depo Services, situated in the beautiful Omni Rancho Las Palmas Resort in picturesque Rancho Mirage near Palm Springs, California. 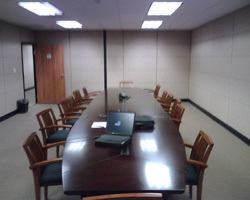 TO&A is ready to provide for all your litigation needs, with fully furnished conference/deposition rooms equipped with state of the art audiovisual technology, LCD projectors and high speed internet. Our highly skilled onsite staff are ready to assist you with any professional and administrative support you may need.